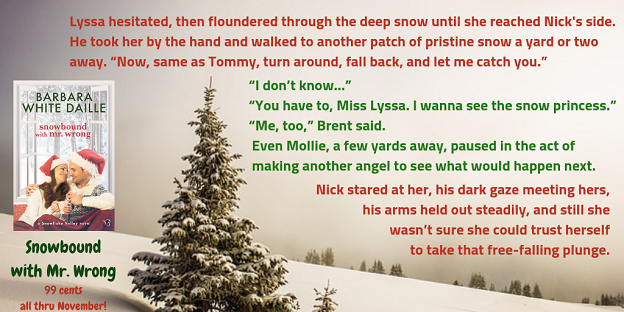 Nick and Lyssa are snowbound in a borrowed ski lodge in Snowflake Valley, and while it’s cold outside, their attraction is heating things up indoors. To read a longer excerpt from the book, please stop by to check out my guest post at Jacquie Biggar’s blog. Snowbound with Mr. Wrong is a sweet romance on sale all through November for only $.99! Find it at Entangled Publishing along with links to all your favorite etailers.